Hanoi (VNA) – Vice President Dang Thi Ngoc Thinh has reaffirmed Vietnam’s strong commitments to implementing the UN Convention on the Rights of the Child (UNCRC) and the country’s Law on Children. While receiving Chief Representative of the UN Children’s Fund (UNICEF) Youssouf Abdel-Jelil in Hanoi on August 4, Thinh asked the UNICEF to continue its support to Vietnam in preventing child abuse, protecting children from injuries, and aiding children of disadvantaged families, especially in remote, border, sea and island areas, in addition to reducing the proportion of children with disabilities and congenital heart disease. The Vice President also proposed the UNICEF share more experience in caring, protecting and supporting children, while coordinating with the southern economic hub of Ho Chi Minh City to build a child-friendly city and expand this model to other localities. She took this occasion to thank the UNICEF for its assistance to and cooperation with Vietnam over the past four decades, thus bringing practical benefits to Vietnamese children, especially disadvantaged kids. 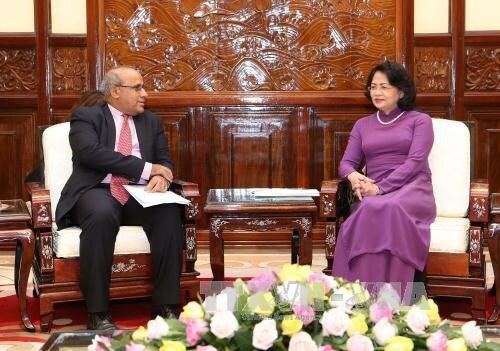 For his part, Abdel-Jelil expressed his hoped that sound cooperative ties between Vietnam and the UNICEF would further develop in the time ahead. The official hailed the Vietnamese Government’s adoption and enforcement of the Law on Children, describing the move as a significant achievement of the country. The UNICEF is willing to support and cooperate with Vietnam to promote activities to take care of and protect children, he said.